Character designer Yoshihiko Umakoshi drew an image to celebrate the final episode of the third season. 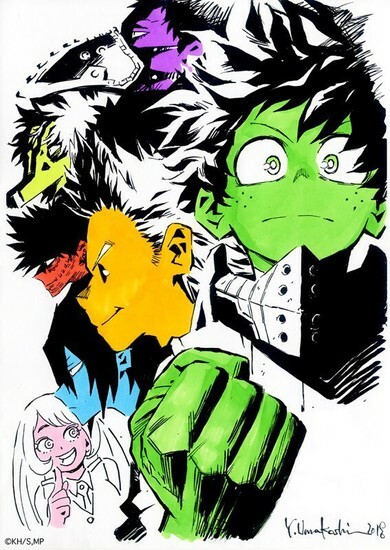 Original manga creator Kōhei Horikoshi also drew an image to commemorate the fourth season announcement. 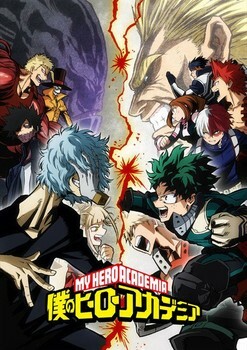 The third season premiered on April 7, and covered the “Forest Training Camp” arc and the “Pro Hero Provisional License Exam” arc from Kōhei Horikoshi ‘s original manga. Funimation is streaming the English dub of the third season, and Crunchyroll and Hulu are streaming the series with English subtitles. The third season features the same staff, including director Kenji Nagasaki at BONES , scriptwriter Yousuke Kuroda , character designer Yoshihiko Umakoshi (with assistance by Hitomi Odashima ), and composer Yuki Hayashi . The anime’s first 13-episode season premiered in April 2016. The 25-episode second season premiered in April 2017. Horikoshi launched the original manga series in Shueisha ‘s Weekly Shonen Jump magazine in July 2014. Shueisha published the manga’s 20th volume on September 4. The 13th and 14th volumes of the manga both bundled OVAs in 2017. Sources: My Hero Academia episode 25 on ytv.